After the creative blast of the 1988 tour Zappa returned to his tape archive once more and started writing the Real Frank Zappa book. Most of 1989 was spent on listening to the 1988 tapes for selecting the best tracks for the two double CDs from the previous section. As it comes to releasing or performing newly written material since 1988, the years 1989-1991 were a period of a relative still. At some point people wondered if Zappa had become more interested in politics and setting up business deals with Russian companies than in composing. He did continue working on the synclavier, eventually resulting in "Civilization phaze III" and "Dance me this". The best sources on Zappa's actual musical activities during the years 1989-1991 are four documentaries that have been broadcast on national TV in various countries. In 1989 Jacques Cousteau commissioned Zappa to write the music for his Outrage at Valdez documentary about the environmental disaster by a leaking oil tanker in Alaska. He wrote a synclavier piece of fifteen minutes, most of it used spread out through the documentary when it got broadcast in 1990. Visit http://globalia.net/donlope/fz/songs/Outrage_At_Valdez.html for the details. To the right the video of the documentary, that used to be available via the Cousteau Society. This synclavier piece also got aired by the NOS on Dutch radio, December 1990, where it got introduced as "the Valdez score by Frank Zappa". "Valdez score" is since then the title bootleggers came to use for their copies of the radio broadcast. 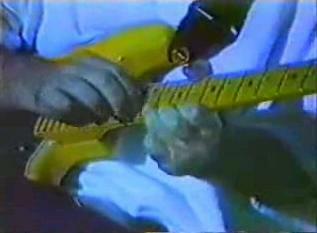 Zappa's comment in the Yellow shark booklet that only 50 seconds of the 1992 "Outrage at Valdez" composition were used for the documentary is bound to be misinterpreted. It suggests that these 50 seconds is the only music by him that got used, whereas what actually is the case is that 50 seconds of "Outrage of Valdez" are present in the "Valdez score". For the largest part these two pieces are different compositions. "Outrage at Valdez" as we know it appeared in total on "The yellow shark" from 1993 with a version played by the Ensemble Modern. It's a relaxed piece of music, well sounding and peaceful. It's in 9/4, just as "Get whitey", to which it is related. "Outrage at Valdez" has a gentle through-composed main melody, played along various side melodies. In the "The yellow shark" booklet conductor Peter Rundell rightly calls it a ballad and talks about the difficult rhythmic relations in it. The transcribed section below isn't that difficult, but you can look at "Get whitey" in the next section for examples of such difficulties. The harmonic climate in this composition is strongly determined by the subsequent pedal notes, over which everybody is playing. The transcribed opening with bars 1-8 is in F minor, played over an F bass pedal note. The staff for the woodwinds represents the lead melody, the others sort of play around it. Outrage at Valdez, opening (midi file). The Valdez score, section (midi file). Outrage at Valdez, opening (transcription). The Valdez score, section (transcription). - "Teen-age prostitute": the apparent B closing chord suddenly moves to a single D (not part of the same scale). - "Pick me, I'm clean": the apparent D closing chord suddenly moves to a C chord. - "Jesus thinks you're a jerk": the apparent C closing chord moves to an Eb chord with an A pedal beneath it (as a combination an 11th chord on Eb). - "Things that look like meat": a solo in G Dorian, that at the very end evades to an Eb7 chord. "Outrage at Valdez" is also coming by in the Clement study and my discussion with Clement. Clement gives this cadence a different meaning than me. See the left menu for the details. In the above transcribed section of "The Valdez score", Zappa is mostly using a self-created scale: B-C#-D#-E-F#-G-A. It's a variation upon B Mixolydian, using G natural instead of G sharp. A few spots with altered notes turn up. Bars 4 and 7 have a C natural and bar 12 has an A sharp. The bass is playing a slow counterpoint line and there's an upcoming and fading harmony chord present. The transcription contains varying meters, but they are to a point my notational choices, so I can't comment upon that aspect with certainty. 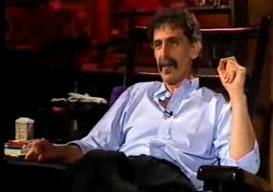 The German documentary Peefeeyatko from 1991 shows Zappa working on the synclavier. Seen his physical appearance, the footage is probably from 1990. This documentary is of specific interest because it contains various sections of synclavier pieces from that time, a mix of unreleased music and pieces from "Civilization phaze III" in an earlier state. You can see him building up a composition by entering notes on the keyboard, speeding things up and combining the result with earlier recorded tracks. He also explains how the sound quality could become so good (image to the right). He would sample a clarinet tone by picking out the best note humanly played from a series per register, recorded in an ideal acoustic area. Than the synclavier can vary the pitch and you get a scale of all the chromatic notes. Using it you get an always perfect sounding clarinet. Electronic music by FZ, section (midi file). Electronic music by FZ, section (transcription). Peefeeyatko contains a section of seven and a half minute with synclavier music, played without interruptions or voice-overs. In the credits it gets referred to as "Electronic music by Frank Zappa". It's an about fifty-fifty mix of components from "Civilization phaze III" and music unreleased on CD. It shows how much Zappa was combining and reusing tracks before he came to the definitive versions on "Civilization phaze III". The above is a section from this "Electronic music by Frank Zappa". It contains a melody played over a steady pulse played by string instruments. It appears that this melody is either recorded independently of the pulse or played over it in a rubato manner. At least I'm not hearing a synchronism. Without information about how such music was constructed, it's difficult to get it on paper with any certainty. So the transcription above is only one by approximation. In 2011 the ZFT released "Feeding the monkeys at ma maison", where you can hear this fragment as part of a larger synclavier composition called "Worms from hell". This five minutes piece is centred around variations upon the pulse as in the transcription from above. The midi file corresponds with 3:39-3:54 from "Worms from hell". 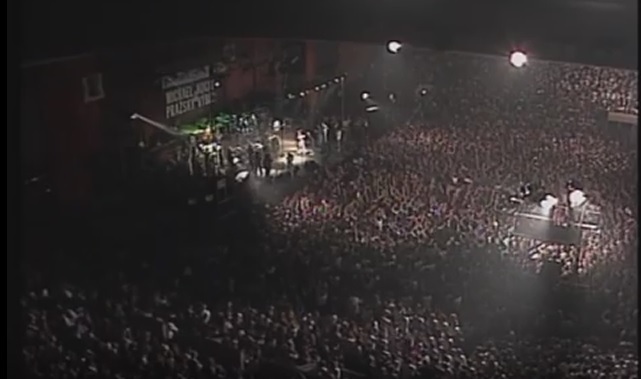 The next year Zappa did some guest appearances during his visits of Prague and Budapest, where people were celebrating the ending of the communist era. Both visits got broadcast on Czech and Hungarian TV channels. In Prague Zappa played one solo with a group called Praczky Vyber, the "Improvisation in A" from below. After congratulating the audience for their uniqueness, Zappa introduces this solo as reggae in A (photo to the left). The group then starts with a reggae vamp over A pedal. It's played in a free form. Traditional reggae has the rhythm guitar consistently playing on the 2nd and 4th beat, but their guitarist is here playing on the first beat just as well. Zappa plays solo in A Mixolydian for some three minutes, whereafter the guitarist from Prazsky Vyber launches a duet with Zappa responding to his phrases. Zappa hadn't touched his guitar for about three years before this gig, but this doesn't show, he's doing fine as usual. Prazsky Vyber included the solo on their "Adieu CA" CD from this concert and their later "Komplet" compilation. Improvisation in A (Prague), opening (midi file). Budapest solo, section (midi file). Improvisation in A (Prague), opening (transcription). In Budapest Zappa went on stage again with another group at a site called Taban. Two of his solos could be heard during the Zappapest documentary, that was broadcast that year. The section above contains a section of the second solo in 3/4, where he's extracting notes out of his guitar as fast as possible. He had done this before towards the end of "St. Etienne". In an interview he explained that for creating this effect of speed he didn't have to pick every individual note. It's a combination of bending the strings and picking them, not necessarily synchronous. On video it indeed looks less phrenetic as the notes suggest (still to the right). It's still possible to hear the individual notes for a transcription. With its a:b formula, the note system supports any rhythmic relationship. The more precise you're notating sections like this, the more unreadable it gets however. The transcription above has drifted far away from sight reading. - "Bossa Nova Pervertamento" (see the Projects section of this study). - The "Be-bop tango" and the "Sheik Yerbouti tango" (see the Roxy section). - "Variations on the Carlos Santana secret chord progression" (see The FZ Guitar book). - The emphasis on pedal notes as in "Friendly little finger" and "Canard du jour". - The appliance of the whole-tone scale in "Echidna's arf (of you)" and the "Sheik Yerbouti tango" (see the Roxy section). - The melismatic Arab-like bars from my "Filthy habits" example. - The "Almost chinese" lick from my Lumpy Gravy section. "EIHN" is of interest in this context because it contains a full-blown Indian piece, called "Roland's big event/Strat Vindaloo". It starts with clarinettist Roland Diry improvising, followed by Zappa on guitar and Shankar on electric violin. See the Joe's garage section for more about Zappa's collaboration with Shankar. 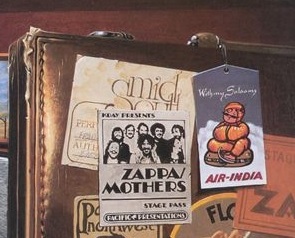 Zappa liked Indian music and once considered flying to India, but eventually didn't go (the "Overnite sensation" album cover refers to this (image to the left)). A pity, because it's a nice country. You don't have to worry about the temperature (the heat is for free) and the collection and disposal of garbage is privatised. Zappa wasn't a traveller by nature and mostly went were it was profitable to hold concerts. This could include Eastern Europe, Japan and Australia, but apparently not Latin America. Roland's big event/Strat Vindaloo, section (midi file). Roland's big event/Strat Vindaloo, section (transcription). - The odd subdivision of the meter, being 3+3+2 as in for instance bars 2 and 5, followed by the figure from bar 6, beginning with a syncope. Thus basically a vamp of two bars, but it keeps being varied upon. - The Indian type of scale, A-Bb-C#-D-E-F-G#. - The frequent occurance of chromatic passages. Other than the title suggests (very spicy), the atmosphere is relaxed. The example above is happening at the transitional part of this track, with the soloists changing. During bars 1-4 you have the end of Roland's clarinet solo. Bar 6 in 3/8 is not an intentional change of meter. It stems from editing out the applause Roland received at the end of his solo on the original tape (as explained in the "EIHN" booklet). After this the original meter returns with Zappa on guitar. At first Shankar is only playing lightly in the background. Next to the percussion section, you can also hear harmonic fill-in on the piano every once in a while. Everybody is improvising, also the bass vamp gets varied upon. It makes the transcribing of it fatiguing, at least if you want to do it rather exact. The result is a nice oddity in Zappa's catalogue, once again stressing the wide range of styles happening in his music. Though the sound is outspoken Indian, no specific Indian instruments are being used to achieve this effect. Above: two stills from the AAAFNRAA documentary, featuring the Ensemble Modern rehearsing with Zappa. I don't know who has the rights to all the footage of the material referred to in this section. Various copies, stills and photos are circulating on the internet. A DVD and/or a CD would be welcome, especially since there's so little else from this time before the rehearsals with the Ensemble Modern started during the fall of 1991. The quality of the music also justifies a wider distribution.